Trails are OPEN from dawn to dusk 365 days per year. Square Lake Rd between Coolidge Hwy and South Blvd. From I-75: Take Square Lake Exit - Travel East on Square Lake until Coolidge Hwy. Turn Left to go North on Coolidge. Stage Nature Center is on the West side of Coolidge, South of South Blvd. From M59: Take Crooks Exit - Travel South on Crooks until South Blvd. Turn Right and travel West. Turn Left at Coolidge Hwy. 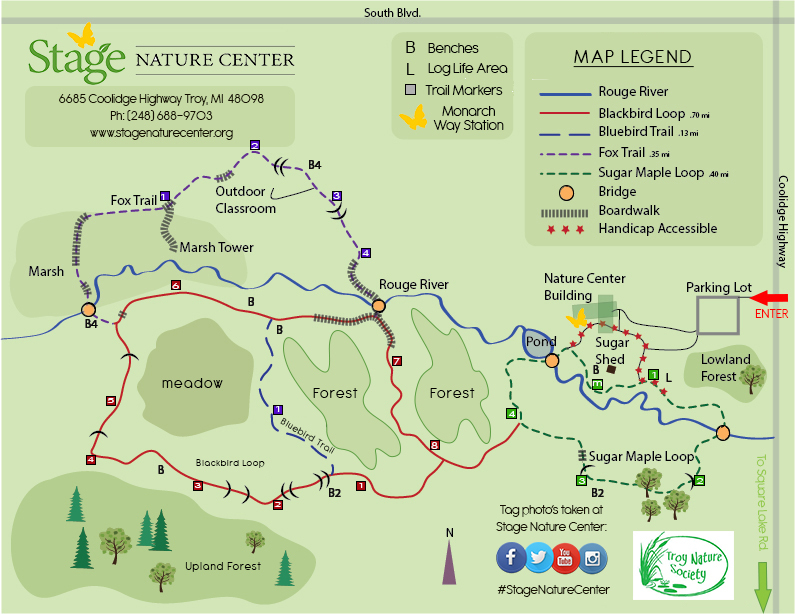 Stage Nature Center is on the West side of Coolidge, North of Square Lake.